Political accountability forms a cornerstone of modern democracy: it directs the political system towards the public interest and allows the exercise of the principles of autonomy and self-determination that lie at the core of democratic politics. Sadly, existing democracies, with their large, centralized bureaucracies, have evolved in ways that progressively undermine the ability of citizens to keep their representatives accountable and political regimes responsive. Far from reversing this trend, the neoliberal reforms introduced since the 1980s have increased that accountability gap. Globalization and the alleged passage from 'government' to 'governance' have aggravated the problem further. The notion of accountability that survives these changes is a problematic form of auditing carried out by a constellation of quangos, autonomous agencies and NGOs whose own accountability is problematic. 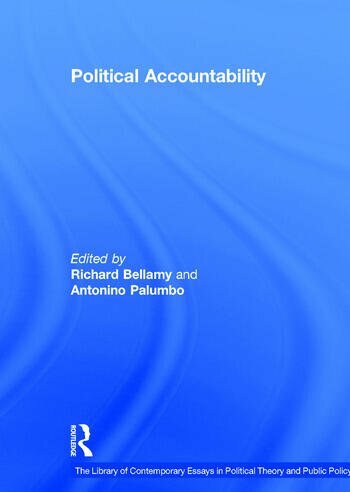 This volume collects the main contributions to current debates on political accountability. It explores the challenges traditional conventions of accountability face today at the domestic, trans- and international levels and indicates the distinctive solutions those challenges require. Contents: Introduction: political accountability reconsidered: debates, institutions, rationale, Antonino Palumbo; Part I Political Accountability and Representative Democracy: The authority of democracy, Thomas Cristiano; Three conceptions of democratic control, Philip Pettit; Democratic legitimacy and official discretion, Arthur Isak Applbaum; Moral responsibility of public officials: the problem of many hands, Dennis F. Thompson; Responsibility and global labor justice, Iris Marion Young. Part II Structural Change and the Erosion of Accountability: Delegation and accountability in parliamentary democracies, Kaare StrÃ¸m; Horizontal accountability in new democracies, Guillermo O'Donnell; Accountability in a 'reinvented' government, Linda Deleon; Accountability in the regulatory state, Colin Scott; Democratic accountability: the distinctiveness of the 3rd sector, Robert E. Goodin. Part III Global Governance and Democratic Accountability: Democratic accountability and political effectiveness from a cosmopolitan perspective, David Held; Accountability and abuses of power in world politics, Ruth W. Grant and Robert O. Keohane; The accountability of government networks, Anne-Marie Slaughter; Democratizing the International Monetary Fund and the World Bank: governance and accountability, Joseph E. Stiglitz; Making sense of accountability: conceptual perspectives for Northern and Southern nonprofits, Alnoor Ebrahim. Part IV The EU and the Quest for Accountability: Why Europe needs a constitution, JÃ¼rgen Habermas; Europe's 'democratic deficit': the question of standards, Giandomenico Majone; In defense of the 'democratic deficit': reassessing the legitimacy in the European Union, Andrew Moravcsik; Still in deficit: rights, regulation and democracy in the EU, Richard Bellamy; The European Union: democratic legitimacy in a regional state?, Vivien A. Schmidt; Name index.